Skewed questions ranging from a Corrs member to a Starland Vocal Band tattoo. The Picture Round is some seriously Warped Politicians and the Wild Card is a cracking statistic about 999 calls. Q05. Vestiophobia is a fear of what? Q18. In the Irish folk rock band The Corrs which instrument does Caroline play? Q27. In which winter sport could you Kizzle Kazzle across the face but end up stuck in the back ring? Q34. In a 1995 episode which cartoon character revealed he had a Starland Vocal Band tattoo on his left arm? Here’s a low-res sample of the Warped Politicians Picture Round, click for a higher resolution version. The Picture Round download is a two page high quality PDF with the answers on page 2. 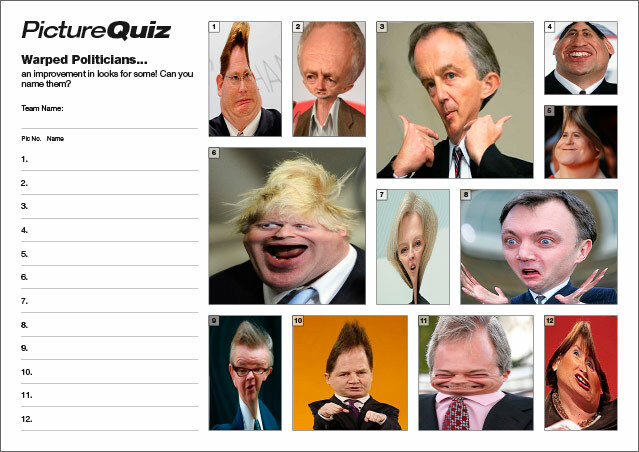 The Picture Round for Quiz 69 is Warped Politicians… do they actually look much different? The Wild Card Question for Quiz 059 is a cracking statistic about 999 calls.